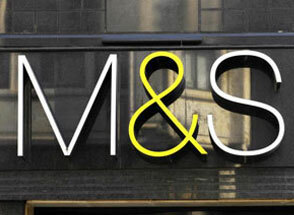 Marks & Spencer posted £3bn of sales over the 13 weeks to 29 December, down 3.9% compared to the prior year. The decision to scale back the international business impacted the headline drop, but like-for-like (LFL) sales have fallen as well. The shares moved slightly lower on the news. Increasing online competition and the high cost of maintaining a high street presence are hitting profit in the Clothing & Home business. The Food business, previously a shining light, has also stumbled as input costs rise and online retailing disrupts the supermarket sector. Meanwhile the economic climate is tough. UK consumer confidence and high street footfall, two crucial factors for a bricks and mortar retail business, are both weak. M&S is hardly alone facing that headwind, but the fact other high street giants are falling left and right isn't much consolation for investors. CEO Steve Rowe is the man with the plan - he's closing stores, reducing spending and increasing digital capacity. For the range, the strategy is to go back to basics - with a focus on wearable wardrobe 'must-haves'. There's some signs this plan is working, with online sales bouncing, and the group describing its recent performance as 'steady with some early encouraging signs'. However, restructuring a business the size of Marks & Spencer doesn't come cheap. While the shares offer a prospective yield of 6.8%, underlying challenges mean it's hard to see profits or dividends rising significantly in the near-term. There could be more difficult decisions on the horizon too. The challenges in the Food business mean that while some new stores are still opening, the focus has shifted to improving those already up and running. This seems sensible, but it does put the pressure on Clothing & Home to reverse its recent poor performances. That is no small ask. Within the UK, the Clothing & Home division is suffering from 'well publicised difficult market conditions' including heightened discounting and lower consumer confidence. Sales dipped 4.8%, which represents a LFL decline of 2.4%. The physical stores suffered from lower footfall, but there was strong growth online, where sales rose 14%. CEO Steve Rowe said he expects more far reaching changes in range and store development as the year unfolds. Within UK Food, despite the majority of stores performing well over the Christmas period, over the quarter as a whole LFL sales fell 2.1%. This decline more than offset the effect of new store openings, with total sales down 1.2%. International revenue fell 15.1%, driven by the sale of the Hong Kong business and store closures. Excluding these effects, revenues fell 1.4% at constant currency largely due to the timing of franchise shipments and investment in improved pricing. Unless otherwise stated estimates, including prospective yields, are a consensus of analyst forecasts provided by Thomson Reuters. These estimates are not a reliable indicator of future performance. Yields are variable and not guaranteed. Investments rise and fall in value so investors could make a loss. This article is not advice or a recommendation to buy, sell or hold any investment. No view is given on the present or future value or price of any investment, and investors should form their own view on any proposed investment. This article has not been prepared in accordance with legal requirements designed to promote the independence of investment research and is considered a marketing communication. Non-independent research is not subject to FCA rules prohibiting dealing ahead of research, however HL has put controls in place (including dealing restrictions, physical and information barriers) to manage potential conflicts of interest presented by such dealing. Please see our full non-independent research disclosure for more information.